We invest in things that create value. This is true in our personal lives too. I don't just mean financial investments, it includes personal relationships, or decorations for our homes, or the car you drive. The value often times is an emotional one. In fact, I would say the most valued things create a positive emotion. When we engage in something that has perceived value, or worth, you feel better, right? IT shops in many companies are seen as predominately a cost center, which is very often viewed as anti-value. We de-emphasize IT, by cutting budgets, when a company doesn't see the value it creates. This simple graph visually depicts the danger of continuous IT budget cuts. 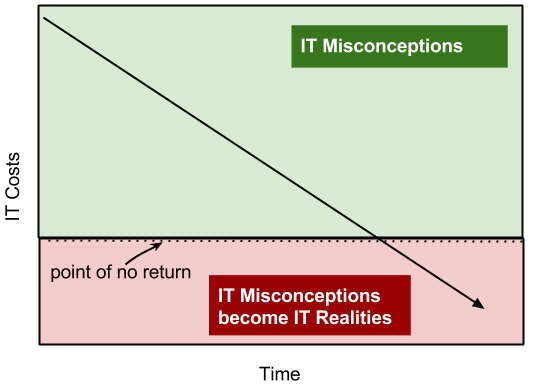 Over time, continuous cutting of an IT budget will cause the misconceptions about IT to become realities. There is a point where the burden of disparate technologies, lack of resources to deliver to timelines, under utilized assets, and lack of coordination about strategic product plans will simply overwhelm the IT department as the budget shrinks. When this happens, the misconceptions are further strengthened, leading to additional budget cuts, eroding more business value. If you agree with me that creating value ought to be the mission for IT, then what we need is a set of disciplines to manage IT like a business. This is where the concept of Technology Business Management (TBM) can help. It is imperative that IT leaders act now to reposition their work as creating business value before this point of "No Return" is crossed. Adopting the TBM framework allows an IT organization to focus on value creation and pivot from the typical cost dominated view. We can break the TBM framework into two broad categories: Run the business and Transform the business. Transform the business: items here improve the way we do business by growing revenue, providing for better decision making, and improve business processes. At AOL we spent the better part of twelve months building our TBM model and completed the bulk of this work in 2013. Last year we concentrated on educating and getting into a rhythm of monthly showback and chargeback models for every line of business. We now account for every dollar spent on IT and can trace this back to the business decision that was the catalyst for the spend. We aren't entirely done with our evangelism phase, and likely we will require some level of constant dialog here. In 2015 we will spend more time doing data analysis and business consulting to allow us to find improvements and innovations we wouldn't have discovered without the rich data we are now producing. Those "moments of impact" are on the horizon for us. I'd encourage you to take a look at the TBM Council website, which provides an overview of the framework, resources for how to begin your own transformation, and an engaged community of IT leaders around the planet who embrace the idea that IT must be about business value creation. Part three in this series will discuss common IT misconceptions. James LaPlaine is the SVP, Technology Operations at AOL. You can follow James on his blog Mental Effort and on twitter @JamesLaPlaine. In a twelve part series about IT business transformation, James explores the need for the modern technology leader to be a catalyst for change, leverage IT value as a corporate strategic weapon, and lead the way for complete financial transparency. Utilizing this approach, today's technology leader can provide the foundation for the company to build better products and services and gain approval for technology led initiatives that often struggle for executive support and funding.